If you organize your stuff a little every day, it won’t be long before your home begins to look nicer. You may be surprised at how much better you feel as well. The reason that many people advocate a minimalist lifestyle is that it simplifies their lives and gives them more freedom to do what they want. Now I’m not quite a minimalist but I do love the results when I clean something out. Even just one drawer or box. There may be things that you want to keep “just in case.” Some of those things may be worth keeping and others are not, and only you can decide. As habits of organizing become more ingrained, it will be easier to get clear about what to keep and what to toss. Something you can’t bear to part with this week may be something you can let go of in a few months. Where Are You Going to Put Stuff? How to declutter a house? Start by briefly adding to the clutter! No kidding, get some free cardboard boxes, or save some that your online shopping has come in. Now find a place where you can keep a few of these boxes, to put things in as you declutter. This could be on the floor out of the way, on furniture that is little used, on the bed in a spare bedroom… chose a good spot, not in the way. It can take a while to declutter your whole scene. As you get set up to declutter, decide if you are going to give your unwanted stuff to a local thrift store or whether you are going to have a yard sale. Hint: the first choice is way easier. In either case, you will be throwing things away as well. So one of those boxes could be labeled TRASH / RECYCLING and the other one GIVEAWAYS. 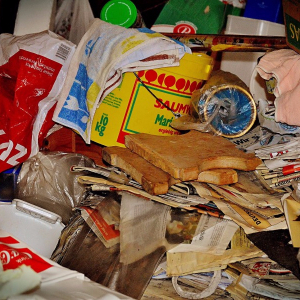 I have enough packrat tendencies myself to understand that it isn’t always easy to get rid of things. We have attachments to them, and when our emotions are involved it’s not always simple to toss out that ugly item that a relative gave you. But it’s YOUR home, and what you want is for it to suit your needs and those of anyone who lives with you. Here is a list of things you can get rid of. Worn out clothing..some items can be turned into rags, if you use rags in cleaning as we do. Broken items… unless you fix them. This could be broken toys, broken jewelry you can’t fix or don’t care enough about, broken tools, etc. If you don’t need it, don’t love it, and don’t realistically expect to need it, get rid of it! You may have plenty of shelves, cabinets, and other things to organize your belongings in, or you may not. Depending on your budget and your tastes, you can DIY with plain old cardboard boxes, which I do for things that won’t normally be visible. If you are artsy, you can decorate boxes. Also, whenever I am in a thrift store I keep an eye on the baskets and over time I’ve picked up some great ones. 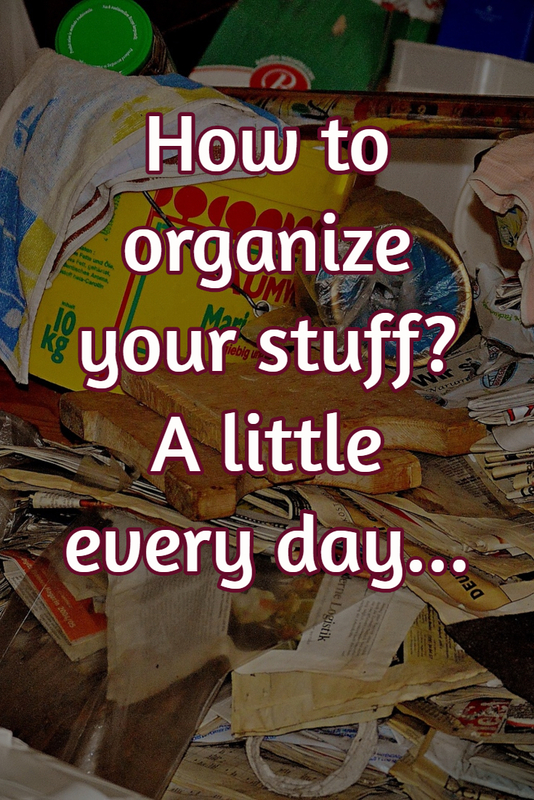 There are a lot of items that can be used for organizing your stuff. Some are a bit expensive and others aren’t. Many of these are likely to last and last… we are still using most of a set of cardboard file boxes I bought before the internet existed! I’ve got to sing the praises of hanging shoe organizers. I’ve used them for shoes, but they are also great for socks, underwear, kitchen miscellany, dog toys, you name it. Our motorhome has three of these things, one in my closet, one in my husband’s, and the most useful one on the bathroom door. I could write a whole blog post on them! Deal with mail as soon as you have it in hand—Since it has to be done, do it right away. Throw ads and other junk mail directly in the trash or recycling bin. Put bills and other important papers in the specified place and shred sensitive papers that you don’t need to keep. To make this easier, change your bills, banking and other statements to paperless and notify catalog companies that you don’t want their catalogs. Before long, there will be less mail to deal with. Nightly pick-up routine—Each family member brings stuff with them into the living room or family room—a mug, a glass, a snack plate, an iPod, a hand-held video game or homework.How frequently that stuff stays in the room! Create a new habit that each night before heading to bed, everyone picks up after themselves. Add a coat rack and baskets—As soon as family members walk in the door, they are likely to take off coats and set down whatever they are carrying, right where these things will be in the way for the rest of the evening. To keep this area decluttered, add a coat rack and a basket or cubby for each person in the entryway. Get family members used to hanging up their coats and putting the other stuff they bring home in a designated place, like their own basket. It will take some gentle reminders, but everyone will eventually appreciate the new peace that a decluttered house holds. Eliminate your junk drawers—This may sound impossible, but it really isn’t. Have a place for everything, including the small items that tend to end up in a junk drawer. Get small containers or use dividers in a no-longer-chaotic sort of junk drawer. Create the habits that will make this effective. Here are some of the bestsellers on Amazon… click on an image to go there and find out more about that book. I love getting inspired by books like these! I like reading them in bed too… not enough plot to keep me awake. So I hope that you found this article useful and that you will choose one thing, or more, to organize and declutter your home.